Update: The ExtraHop Discovery Edition is no longer being actively maintained. There's some World Cup mania taking hold at ExtraHop HQ, as is likely in offices around the world. Our technical marketing engineering (TME) team expressed their enthusiasm in a unique way—by building a solution module for monitoring World Cup streaming with ExtraHop. The World Cup Tracker module parses web requests to ESPN Gamecast to pair match IDs in the header with match names in the payload. 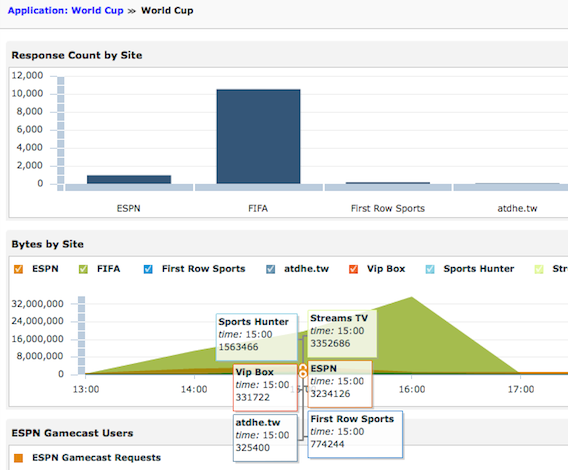 Visits from clients on your network to various websites offering World Cup content, including ESPN.com and FIFA.com, along with the client IP addresses and device names. The amount of web traffic requested from each site, along with client details, providing insight into the amount of World Cup streaming on your network. 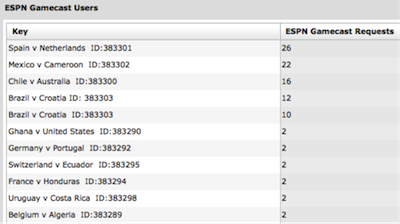 Which ESPN Gamecast matches are most popular in your office. For example, you can see Brazil vs. Croatia was viewed more often than Switzerland vs. Ecuador. The World Cup Tracker solution bundle is another great example of the flexibility of the ExtraHop platform. You can easily program the real-time stream processor at the core of the ExtraHop platform to analyze the L2-L7 communications between servers however you want. An example: To show which matches people are viewing on ESPN Gamecast, the TME team paired the unique match ID in the header (383303) with match title contained in the HTTP payload (Brazil vs. Croatia). With the ability to mine anything in the transaction payload, the possibilities are really only limited by your creativity! Ready to get started? Download our free ExtraHop Discovery Edition virtual appliance, then apply the World Cup Tracker module. While you're at it, you might also want to check out our cloud monitoring bundle that lets you track usage of cloud applications such as Google Drive, Dropbox, Salesforce, Spotify, and others. ExtraHop parses transactions to World Cup streaming sites so you can track streaming activity. Set up streaming in a conference room so that employees are not eating up bandwidth by watching games at their desks. It's more social, too. If your organization has a policy regarding streaming, communicate that with employees now. Security experts warn that the World Cup is prime-time for hackers. Warn your users against visiting dodgy sites and instead stick with legitimate sites like ESPN.com and FIFA.com.